I was going to take a break from blogging because I kind of OD'd this week but I had to write a little something about the passing of Bernie Mac. Mac was an amazing comedian and a great man. His distinctive voice and style was something that set him apart from other comedians. A contemporary of Steve Harvey, D.L. Hughley and Cedric the Entertainer (together the "Kings of Comedy") he had a style and swagger that was in many ways unmatched. Personally, I loved his performances in the Ocean's Eleven films. He brought a wonderful sense of levity to those films. His ability to turn a personal pain (his sister's drug addiction) into a hilariously poignant comedy routine and later into a network sitcom, shows just how adept a talent he was. It's a shame that another great star and truth teller has been taken from us. I hope Bernie Mac and George Carlin are telling jokes to Buddy Jesus right now. Rest in peace. 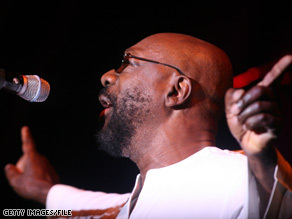 UPDATED: Soul singer and the voice of South Park's Chef, Isaac Hayes passed away today, Aug. 10th, at 2 p.m. Another great soul lost. Rest in peace.